Another look at our blog, made us think: Why do we still look so 90's? We installed a new commend system called "Disqus"
And we generally want to make your stay more comfortable. This is a quick tip. If you need to push a notification to your smartphone, or even send a file, I recently stumbled upon "Pushbullet". Continue reading "Push a file to your Smartphone"
I recently bought a second raspberry pi, for the purpose of making it a "dumb" media center running XBMC (Raspbmc to be exact). I already have a media center PC running XBMC on Windows 7, and I wanted to connect my raspberry pi to the downloaded media, stored remotely on the Win7. Anyways, I have spent almost two days, understanding how to connect the Raspberry pi to Windows 7 using NFS. It was not easy, because it seems Microsoft has dropped support for it on home OS (even Win7 ultimate) since Windows XP. I ended up doing it with Cygwin (which gives powerful Linux capabilities to windows machines). I want to outline what I have done in order for this to work. This process could be very easy and it could be frustrating. I really hope it will help you do it yourself. The original guide I used can be found in this link, however it did not work at once and I had to tweak a bit. Also, it is referring to Windows XP. Here it is: Continue reading "Share NFS from Windows"
Sara Baraeilles's "Brave" and Katy Perry's "Roar" sound very similar. So I took two acapellas and instrumental and mixed them together. # When this exits, exit all back ground process also. # show tails of each in background. So a friend gave me a locked device. This device had no Google account linked to it (which prevented me from bypassing the lock with that account), there was no root or ADB access via recovery, and the USB debugging option was disabled. I found this guide here, which states some commands you can type in ADB shell and should deactivate the pattern lock. So – How do I get ADB access on that phone? Continue reading "A Creative way to bypass Pattern lock on Android"
Not long ago, I have purchased an IP camera for my home. A nice toy I must say. I wanted to expose this camera for outside access. The issue is that this camera's interface does not support SSL. Well because privacy is involved, the least I could do is add SSL somehow. I googled a bit and came across this article. I decided to use my raspberry pi for that. The process itself is relatively easy but I had to do some improvisations over the article above. So I decided to make a tutorial for this. You can use this to add SSL layer on top of every http you have. So here we go: Continue reading "Using your Raspberry Pi as an SSL Proxy"
We are currently switching hosts which should lead to a faster website experience. During this process, our emails might not be available for a while. A few months back I placed an order for a raspberry pi. For those who don't know what it is, it is a really cool project which is basically a computer for 35$ (Shipping for me almost doubled it, but that's to be expected). It is a board, which as 256MB Ram, SD-Card slot, 2 USB Slots, an RCA Slot for analog video, and a headphone jack for analog audio. It is originally a project for schools, to help today's kids get started with (python, but not only) programming. The Raspberry Pi is a credit-card sized computer board that plugs into a TV and a keyboard. It's a miniature ARM-based PC which can be used for many of the things that a desktop PC does, like spreadsheets, word-processing and games. It also plays High-Definition video. The OS of this board is stored on an SD Card. I have bought a class 10 16gb SD Card off of eBay for this purpose. 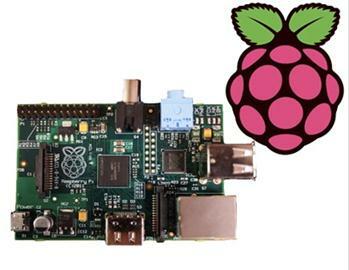 Here are some common suggestions for usages: Continue reading "The Raspberry Pi is Here"